Women’s Rights in India submitted to ‘Our World in Motion’ on National Geographic. Kristian Bertel has contributed to the National Geographic Your Shot photo community with an assignment called ‘Our World in Motion‘. For this assignment curated by Amy Toensing a National Geographic photographer and Matt Moyer, a National Geographic photographer as well wants us to photograph motion in the world. The ticking of the clock shatters this illusion, reminding us that the second hand is hurtling forward forever chasing the future. As Amy and Matt are saying it: ”- We live in a world in motion. Forever changing and growing, moving and blurring. Our job as still photographers and your assignment is to capture it. How do you show a world in motion? Of course, you think of bicycles blurring, people dancing or birds in flight but also think of ripples on a lake, or wrinkles on skin. Star trails hint at the earth’s rotation as a lava flow builds a new world. Motion is progress and propulsion. Cultures and norms are forever in flux advancing and contracting they too are in motion. So we ask us to sit quietly for a moment contemplating Our World in Motion, then grab your cameras and capture it!”, they say. 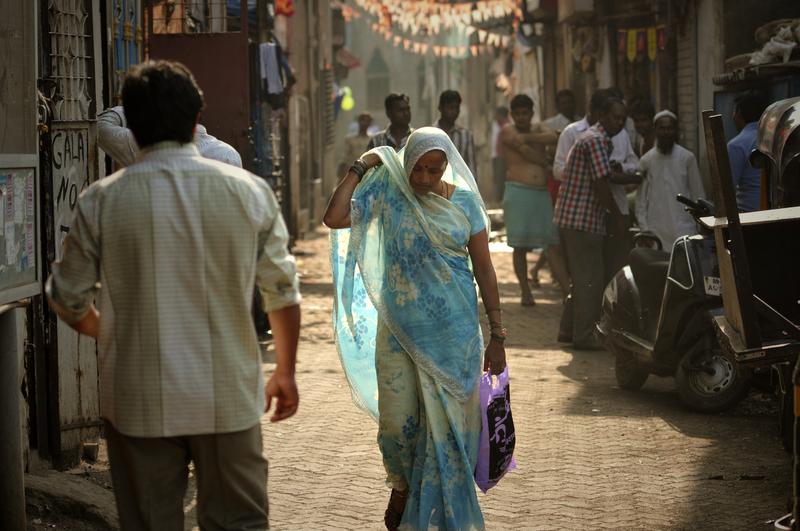 The photographer chose to submit a photograph of an Indian woman walking in a street in Mumbai, India. Women in India face myriad cultural challenges that impede social advancement. Discriminatory family codes, lack of education, and cultural stigmas are only a few examples. Heightened media attention given to such inequities has raised pressure on the government to not just reform the institutional treatment of women, but also raise the level of dialogue on the larger issue of women’s rights in a rapidly modernizing society. What is most galling is the attitude of Indian society towards its women. This discrimination within the family breeds violence across society against women. Any violation of social norms is treated with contempt. In the past couple of decades, education has enhanced the mobility and visibility of women in Indian society. But it is just a small development. The emancipation of women from tradition and patriarchy is a long-time struggle. India has been witnessing a continuous struggle by women’s rights groups to break the barrier of tradition and create awareness about the rights of women in the country. Things are slowly changing but there is still a long way to go. In India, domestic violence toward women is considered as any type of abuse that can be considered a threat, it can also be physical, psychological, or sexual abuse to any current or former partner. Domestic violence is not handled as a crime or complaint, it is seen more as a private or family matter. In determining the category of a complaint, it is based on caste, class, religious bias and race which also determines whether action is to be taken or not. Many studies have reported about the prevalence of the violence and have taken a criminal-justice approach, but most woman refuse to report it. These women are guaranteed constitutional justice, dignity and equality but continue to refuse based on their sociocultural contexts. As the women refuse to speak of the violence and find help, they are also not receiving the proper treatment. ”- The status of women in modern India is a sort of a paradox. If on one hand she is at the peak of ladder of success, on the other hand she is mutely suffering the violence afflicted on her by her own family members. As compared with past women in modern times have achieved a lot but in reality they have to still travel a long way. Women have left the secured domain of their home and are now in the battlefield of life, fully armored with their talent. They had proven themselves. But in India they are yet to get their dues”, the photographer Kristian Bertel says.